If you want to give some extra special attention to a few folks on your list, why not embroider their Christmas cards? Not only does a handmade greeting say that you care, but it's also a frameable gift! Best of all, it's easy enough to stitch in an evening or two. This modern tree pattern is made up of circles and dots and you only need to know three stitches. If they're new to you, they're not difficult to learn. Of course, you don't have to only use this to make cards. A polka dot tree would also look great embroidered on fabric and framed in a hoop for holiday decor or a gift! 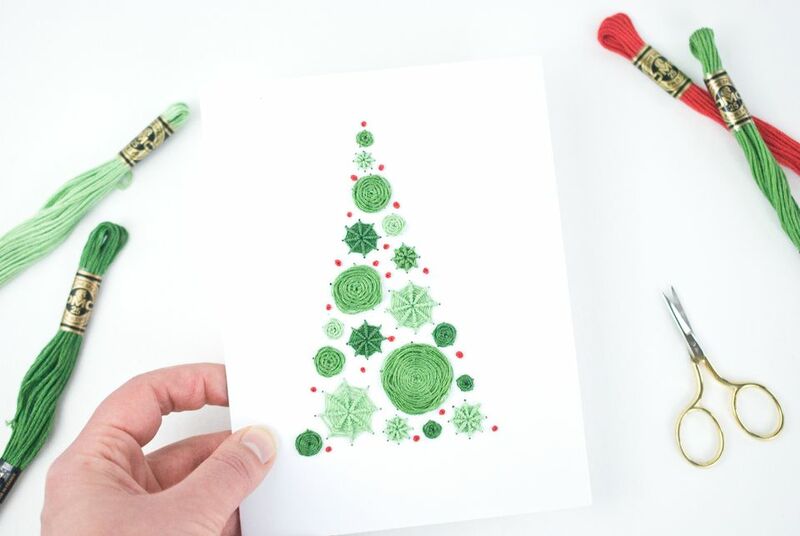 Download the Polka Dot Tree pattern and use your computer software to adjust the size to best fit the blank card you are using, then print the pattern on regular paper. Trace the pattern onto the front of the card with a pencil. You don't need to trace around each circle. Instead, mark the end of each "spoke" and the center point of the wheels. These will be the places where the thread will pass through. If you look closely at the photo above, you'll see that rather than dots for the spoke markings, there are small lines. This makes it easier to see each wheel and not just hundreds of dots. Follow the guide for stitching on paper and poke a hole at each marked point of the pattern. Be sure to support the card with either cork or some scrap cardboard. Select a minimum of three colors for the main part of the tree, plus an accent color for the tiny dots. Using tints or shades of the same color for the tree helps to keep the look cohesive. In the embroidered sample, the colors are DMC 987, 988, 164 and 349. The greens and reds definitely have a Christmas look to them, but you could change the red to white, or stitch the tree entirely in light blues and white for a more winter style. And if you want to stitch something a little more festive, choose a rainbow of colors and have the tree change hues from top to bottom! This card uses three different stitches to make the circles and dots. On the pattern you'll see tiny dots and circles with spokes. The tiny dots are french knots, the circles with five spokes are woven wheel stitch and the circles with eight spokes are spider web stitch. Embroider the circles first, evenly spacing the colors, then add the french knots last. You may find it easier to stitch the smaller circles first and then work your way up to the larger circles. This helps prevent catching or snagging the larger stitches. When working the woven wheel stitches, avoid pulling the weaving too tight, which results in more dimensional stitches. For a card, it's best to have flatter stitches. If you're using this pattern for embroidered hoop art, go ahead and make those stitches as thick as you'd like! Although it's best to start and end embroidery without a knot, working these stitches on card stock can make that tricky. So it's okay if you use knots. Just be sure they don't pull through to the front. A tiny tab of tape helps with this! Even if you stitched carefully and without knots, the back of this stitching isn't what you want on the inside of the card. Cut a piece of scrapbook paper (or something else pretty) and use double-sided tape to cover the back of the embroidery. You can use this as a design element too. With plain or a subtle patterned paper covering the back of your work, write a message on the paper. This is also good if you want to stitch a flat card that doesn't fold. Write your greeting, slip the card in an envelope and deliver it to someone special! If you're planning to mail this, remember to take it to a postal clerk for accurate postage and hand-canceling.